Visions : Notations On Our World (Special Edition): #GlobalCitizenFestival is About to be Live!!!! Notations On Our World (Special Edition): #GlobalCitizenFestival is About to be Live!!!! 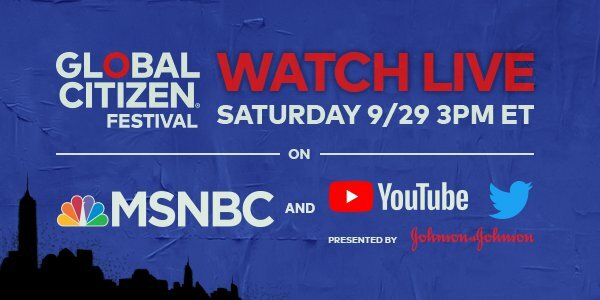 Watch live coverage of the Global Citizen Festival on MSNBC and nbcnews.com/globalcitizen this Saturday, Sept. 29, beginning at 3 p.m. ET. Stream the full festival live on YouTube, thanks to Johnson & Johnson, starting at 3 p.m. ET on Sept. 29. Visit our channel to set a reminder. (YouTube will send you a notification when we go live.) We'll also be posting performances, speakers, and clips of world leaders making crucial commitments on our channel throughout the night, so you can go back and watch your favorite moments over and over again. Stream the full festival live on Twitter, also thanks to Johnson & Johnson, starting at 3 p.m. ET on Sept. 29. Visit our livestream page to set a reminder. (Twitter will send you a notification when we go live.) We’ll also be tweeting live coverage of the festival, so make sure give us a follow. Join the conversation yourself with #GlobalCitizen and #BeTheGeneration. Don’t go anywhere! We’ll be streaming the festival live on our website at the New York City festival page, starting at 3 p.m. ET on Sept. 29.